In our previous article, we have listed “Countries with most beautiful hair in the world“. Today, let’s discuss and talk about Countries with most beautiful eyes in the world and their linkage with personalities from our research and studies. Eyes are the windows to your soul. They reflect every part of your personality in no time. A kind-hearted person has a lot of generosity in eyes. On the other hand, a shrewd person has a lot of anger and aggression within the lids. Your eyes can speak a lot more than your lips. They hold the ability to express anger, love, affection, care, and Desire with utmost precision. Different countries have different kinds of eye colors and shapes. The most beautiful eyes in the world are the ones who have a love for mankind. Maximum of the people across the globe are blessed with brown colored eyes. However, every country has a mix of Blue, Green, Brown and Black Iris. The United States has the majority of Blue Eyes in the world. On the other hand, Sweden and Norway have a high percentage of people having light eye colors. 80% of People in Netherland have green and blue eyes. It is said that green colored eyes account for only 1 – 2% of the entire population living in the world. Although green eyes are dominant upon blue color, yet they are scarcely seen. Black Eyes – People having black colored Eyes are born eiders. Often dark brown color is most of the time taken as the black color. However, True black eyes are very rare in the world. They look peculiar and enigmatic. Blue Eyes – The beautiful Blue Eyes reflect the inner strength and physical endurance. Blue Eyes are often taken negatively. They are identified as untrustworthy, weak and timid. However, German psychologists have revealed that blue-eyed children are quite competitive than others. They can be introvert but that doesn’t prove that they are negative people. The blue color has always reflected serenity. And therefore, people having such an iris are quite calm and non-reactive. Grey Eyes – Grey is a slight variation of blue color. If you are blessed with grey eyes, you are a perfectly balanced person who can handle oddest situations easily. The great analytical power of observing pros and cons of a situation is appreciable in you. Hazel Eyes – Beautiful Hazel eyes can range from Blue, brown to Green variation. Generally, people with Hazel eyes have a ring around their pupil. The shade is uncommon and is known to belong to very few people. Hazel eyed people are generally introvert and a difficult to be understood. Medically speaking, people who have Hazel eyes are known to suffer from digestive disorders. Brown Eyes – The most common eye color in the world is brown. It is one of the most beautiful eye colors that showcase loyalty, gentleness, and gratitude. Such people need a special way of handling as they are not at all submissive. People having beautiful brown eyes need a slightly less amount of sleep and they find it hard to get up early in the morning. The Scandinavian eyes are light in appearance. they are truly mesmerizing and attractive at the same time. Women of Scandinavia have known for their beautiful looks amongst which their eyes contribute generously. Most of the Indians have brown colored eyes that can be round, almond, large, small and closed set Eyes in shape. Indian women have the largest varieties of beautiful eyes in the world. In fact, there are quite a significant number of Indian women who have been the beauty pageants because of their beautiful eyes. Egyptian eyes are slightly different in looks. They appear quite dominating in nature. The distance between eyes is wide. A pair of Egyptian eyes clearly reflects sheer determination, strength and sturdy personality. The tall Egyptian women look perfect with their beautiful pair of eyes having different color variations. Canadian people have close – set of Eyes most of the time. such people are not very embracing towards the changes. Little stress laid over such people can end up in a lot of resistance from them. Round eyes of people belonging in New Zealand or magnanimous, charming and personified. They appear really innocent with a mild tinge of blue in them. How can we forget to include the beautiful Arabian Eyes on our list? There is no comparison of those glamorous, classy and traditional pairs of eyes hidden behind the Hijab. The almond-shaped eyes of Arabian girls reflect their hidden desires and love for their religion. 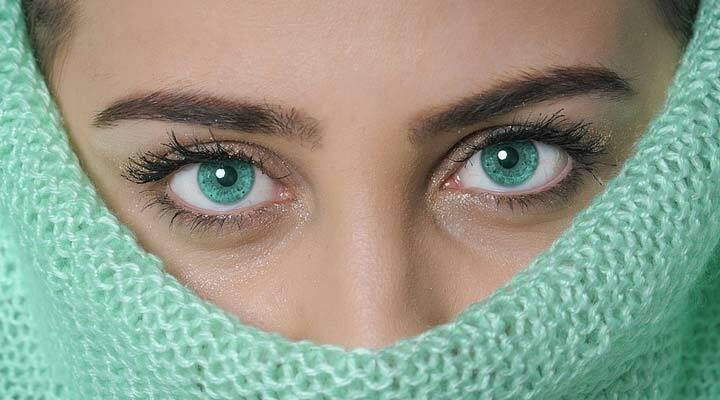 Saudi Arabia is one of the countries with most beautiful eyes in the world. Women of Philippine are blessed with wide – set Eyes which look enchanting and exploring. Philippine ladies are broad-minded, flexible and adaptable. They are happy to go and difficult to restrict on a particular monotonous routine. The adventurous and impulsive personalities of Filipina girls are clearly visible in their eyes. The beautiful and vibrant eyes of a French woman clearly reflect her attitude and romantic personality. The big eyes having blue-colored eyeballs in them appear sophisticated and zealous. The typical almond-shaped eyes of Japan look really innocent and beautiful. Japanese eyes have a close resemblance with Chinese and Nepalese Eyes. When adorned with eye cosmetics, the beautiful pair of Japanese eyes can loot your heart in no time. So, which country has the most beautiful eyes in the world? Beauty beholds in the eyes of the onlooker. Every pair of the eye made by almighty is beautiful. Some people may fall in love for Hazel eyes, while others may develop a liking for blue and green colored eyes. Exceptionally, people may feel comfortable with brown-eyed people as they are easy to understand and comfortable to get along. There are no particular parameters for determining the most beautiful eyes. Every country has a heterogeneous mixture of different eye shapes, eye colors, and personality types. The windows of the soul can never be ugly no matter what color and design they have. Apart from the mentioned list of countries, there are many other places where you can find people with deep-set eyes, monolid eyes, hooded eyes, protruding eyes, upturned eyes and downturned Eyes. All the countries are beautiful as they have been blessed with most suitable varieties of Eye colors and shapes. This was so interesting! I had no idea that personality correlated with eye color. East Indian women have the most beautiful eyes and face structures. Brown eyes – have a hard time getting up early in the morning. This is SO me… even though I have two kids lol. I’m a mombie! Very interesting post I liked learning about the eye color traits. And about the counties dominate eye colors. I love this! Eyes are truly the window of the soul and I love seeing the different eye colors in the world. I really think eyes have a way of expressing the person’s soul. Many have said that my son has an old soul because of his eyes. We can see a beautiful world in our beautiful eyes. This is great job.